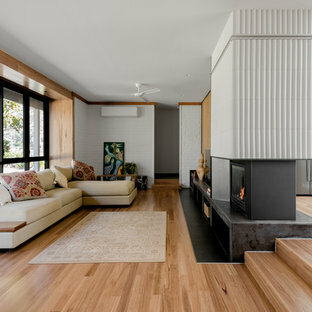 This is an example of a large beach style living room in Sydney with medium hardwood floors, white walls, a ribbon fireplace and a built-in media wall. Design ideas for a large contemporary open concept living room in Canberra - Queanbeyan with a wall-mounted tv. Inspiration for a large midcentury open concept living room in Other with white walls, medium hardwood floors, a two-sided fireplace, a tile fireplace surround, a freestanding tv and brown floor. 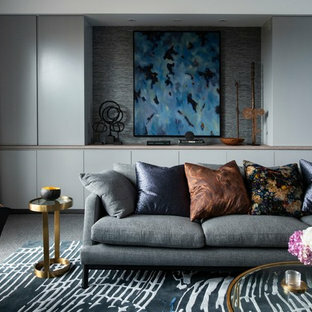 Inspiration for a large contemporary living room in Sydney with carpet and grey floor. 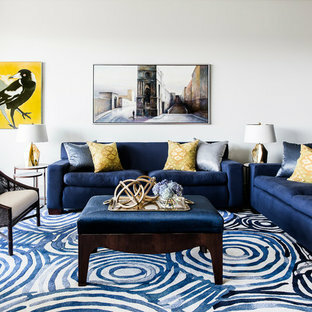 Inspiration for a large contemporary formal open concept living room in Sydney with white walls, carpet, no fireplace, no tv and blue floor. 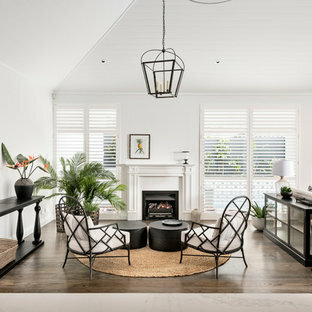 Inspiration for a large contemporary open concept living room in Melbourne with white walls and medium hardwood floors. 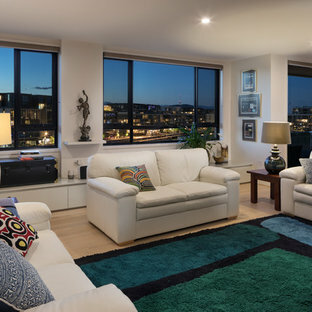 This is an example of a large contemporary open concept living room in Sydney with a hanging fireplace and a wall-mounted tv. 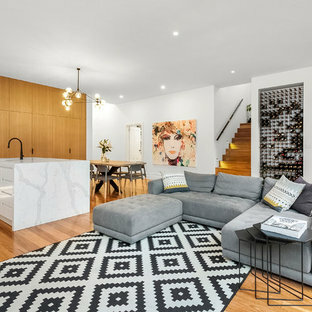 Photo of a large contemporary formal open concept living room in Melbourne with white walls, medium hardwood floors, a ribbon fireplace, a plaster fireplace surround and beige floor. 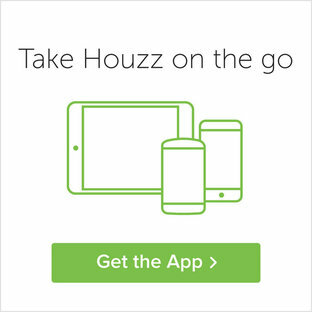 The concept for this residence was to create a fresh liveable family orientated interior that combined a coastal style with an underlying French aesthetic. For this project we custom designed the dining chairs and chose a specific colour weave to tie in with the chosen colour palette. The chairs needed to withstand everyday use with young children in mind. A palette of blue, crisp white, and tones of grey was decided upon for both the exterior and interior areas of the house. During this renovation many elements needed to be considered to bring a cohesive look to the entire project. French grey flooring complemented the cool soft colour of the bathroom tiles. 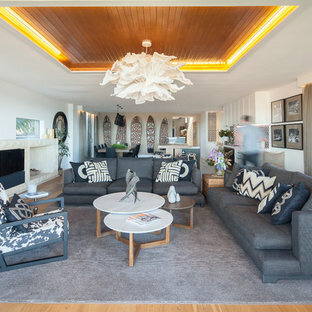 A variety of materials were used to give the interiors a layered and textural style. Design ideas for a large beach style open concept living room in Other with white walls, medium hardwood floors, brown floor, a standard fireplace, a metal fireplace surround and no tv. 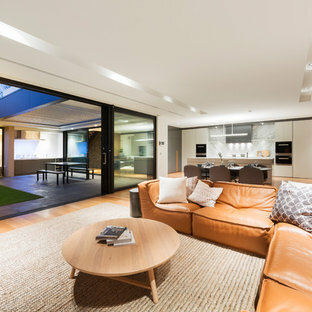 Photo of a large contemporary open concept living room in Melbourne with a hanging fireplace. Inspiration for a large transitional open concept living room in Melbourne with beige walls, a standard fireplace, a stone fireplace surround, a built-in media wall, brown floor and dark hardwood floors. Design ideas for a large beach style formal enclosed living room in Gold Coast - Tweed with beige walls, light hardwood floors, a stone fireplace surround, a wall-mounted tv, grey floor and a ribbon fireplace.